Confession: I sent my husband out last night to retrieve this book for me while I made dinner for the kids and tried to breathe deeply. This pregnancy . . .it palls, you guys. The thing is, he was happy to do it and even (after some creative detective work) snagged the very last copy at our local bookstore! I was incredibly relieved. Because all I wanted to do last night, after dinner and talking to my two squirts, and reading Harry Potter and the Deathly Hallows with Will, was get comfortable on the couch and drift off into the wonderful world of Walls of Water, North Carolina. I'm telling you, there is nothing, but nothing like a brand new Sarah Addison Allen book when it comes to comfort reading. You just know you're gonna get the full southern treatment, that the prose will be lighter than air, and that magic will swirl through your veins like cream in one of Rachel's red-and-white striped coffee cups. These are the things you can count on, and The Peach Keeper doesn't disappoint in the slightest. Willa Jackson returned to the stifling confines of her hometown of Walls of Water, North Carolina eight years ago when her father died. Despite her eternally restless nature, Willa resolved to buckle down and be the docile daughter her father had always wanted, even though it was now too late. So she bought the local organic sporting goods store and settled into a life of safe monotony. She visits her elderly grandmother once a week in the nursing home, even though Georgie doesn't recognize her anymore. She does her laundry every Friday night without fail. And if she sometimes drives up to sit and look at the old Blue Ridge Madam mansion and wonder, well, that's her business. Paxton Osgood is determined to restore the Blue Ridge Madam to its former glory and put on the best gala the Women's Society Club has ever seen. But things start going wrong from the get go, and obsessively detail-oriented Paxton is afraid everything will fall apart at her feet. It's now when she needs this success most of all, especially as her stalwart friendship with former outcast Sebastian Rogers is bleeding into uncharted waters. Then Paxton's twin Colin returns home to help with the renovation and, when he runs across Willa, remembers all the reasons he left in the first place. Meanwhile, a strange presence is swirling its way through the town, stirring up old ghosts better left hidden. Against her better judgement, Willa is drawn into the disturbing events up on Jackson Hill and into the lives of the Osgood family once more. The day Paxton Osgood took the box of heavy-stock, foil-lined envelopes to the post office, the ones she’s had a professional calligrapher address, it began to rain so hard the air turned as white as bleached cotton. By nightfall, rivers had crested at flood stage and, for the first time since 1936, the mail couldn’t be delivered. When things began to dry out, when basements were pumped free of water and branches were cleared from yards and streets, the invitations were finally delivered, but to all the wrong houses. Neighbors laughed over fences, handing the misdelivered pieces of mail to their rightful owners with comments about the crazy weather and their careless postman. The next day, an unusual number of people showed up at the doctor’s office with infected paper cuts, because the envelopes had sealed, cement like, from the moisture. Later, the single-card invitations themselves seemed to hide and pop back up at random. Mrs. Jameson’s invitation disappeared for two days, then reappeared in a bird’s nest outside. Harper Rowley’s invitation was found in the church bell tower, Mr. Kingsley’s in his elderly mother’s garden shed. If anyone had been paying attention to the signs, they would have realized that air turns white when things are about to change, that paper cuts mean there’s more to what’s written on the page than meets the eye, and that birds are always out to protect you from things you don’t see. See what I mean? You can just count on her. 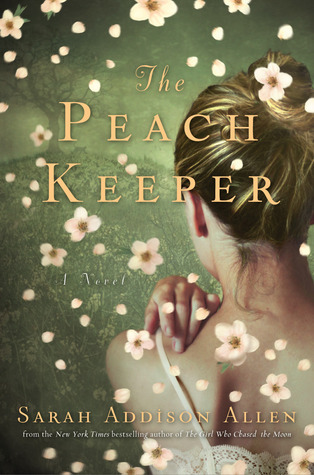 I'm delighted to say that The Peach Keeper is one of Sarah Addison Allen's best works to date. It fully lives up to the promise of each of her previous novels and instantly shot to my keeper shelf. I read it in one sitting last night, and it was an infinitely blissful experience spending time with Willa, Paxton, Colin, and Sebastian. The wonderful thing about this book is that I was equally enamored of and involved in the story lines of both main characters. I mentioned before that I tend to identify with one heroine over another in Allen's books and, since the point of view alternates back and forth between them, I occasionally wish I was back with the other before I actually am. This was happily not at all the case here. Willa and Paxton are so different in personality and background and yet I loved them both equally. And not only them, but their relationships with their family members and their respective young men. It was very interesting (and amusing) watching Willa struggle to come to grips with a possible relationship with Colin, who is Paxton's twin. Even more moving was Paxton's relationship with Sebastian--a troubled young man on the fringe of society, who caught her eye once in high school and has now grown into an incredibly complex and magnetic adult who, despite his respectable job and tailored suits, still exists just on the edges. Their interactions brought tears to my eyes multiple times. I ached for them. And the few scenes that all four share together are breathtaking and funny. The Peach Keeper is at once haunting and charming, in that perfect blend of magic and realism that Sarah Addison Allen has worked into an art form. Highly recommended. Glad you enjoyed this one too! And you're right that her books are quintessential comfort reads. I still remember getting Garden Spells out of the library on a Saturday morning and finishing it before bed that same day! I CANNOT wait to read thi. I absolutely love her, and I'm glad this sounds as good as her other books. I was a bit scared it would not live up to her previous work. Garden Spells is my favourite one, the The Sugar Queen, then The Girl Who Chased the Moon. I was worried this would continue the trend, but it sounds like I will like it a lot! Yeah! I have "The Sugar Queen" in my TBR pile and it will be my first book by Sarah Addison Allen. Hope I will like it just as much as you like her books. I have seen the books around but never took time to read any reviews. I will definitely have to check this author (and book) out! Wow, that was fast! I can't believe you were able to read and review it after only a day. As usual, your review made me want to get a copy of this as soon as possible. Garden Spells is my favorite Sarah Addison Allen but I enjoyed reading all of her other books. I hope this one becomes available in local bookstores soon. Garden Spells was sweet and light, whereas The Sugar Queen was darker. In that respect, is this one more like Garden Spells, or like The Sugar Queen? lisa, lol. That's awesome. I remember reading it fast, but not quite that fast! Katy, it's excellent. I had no interest in putting it down until I'd read it all the way through. MJ, I know. I was a bit concerned as well. But no worries needed. It was beautiful. Sabrina, so do I! I'm glad you've got THE SUGAR QUEEN. I adore it. Cait, I really think she'd be right up your alley. Her books are irresistible, IMO. Chachic, I hope it finds its way to you quickly as well. I couldn't put it down. Thanks. I adored Garden Spells. It was one of my favorite books that year. I guess I'm going to have to get this one as soon as the price comes down a bit. Sounds like you had a wonderful evening with this book! Reading this was like reading something I could have written! I pre-ordered The Peach Keeper for my Nook, downloaded it yesterday morning, and looked forward all day to reading it. Last night, after dinner & time spent with hubby, I sat down and read the whole thing in one sitting. LOVED it! And I agree that this one is more like her first two. It didn't disappoint! I completely agree with you on the comfort reading. And her book seem to go by so fast (although staying up until 3AM might have something to do with it). I can't wait to read this! I didn't quite fall in love with Sarah Addison Allen's second and third books, but I adored Garden Spells. This is definitely a book for the wishlist. I'm beginning to fall in love with magical realism (ever since I started reading Angela Carter). And hey, this one sounds like my piece of pie! Sometimes when they're multiple p.o.vs I also connect more with one character and I keep waiting for the story to cycle back to him/her. Thanks so much for linking to my review. Like you I'm a HUGE Addison Allen fan (and apparently we both like Harry Potter too - I'm in the middle of reading HP Goblet of Fire with my nine year old daughter)! Oh I am so happy to hear this one is vintage SAA. I can't wait to get a hold of it for myself. And hang in there with the pregnancy girl! I feel ya! I have not read any of Sarah Addison Allen's books, however they seem just the type of book that generally catches my attention. I still have a Christmas gift-card for my e-reader that just might have a few dollars less by the end of the day. I already know that I love Sarah Addison Allen's writing, so really it is just a case of exactly how much I love this book in particular! I just picked it up from the library, and after reading your review I have just realised exactly what I am going to do with my Friday night at home alone! I thought there were less magical elements in this one though, but it didn't bother me too much, because I was loving the characters and the setting a lot. I kind of wish Sebastian handn't turned out to be straight, as my only complaint about her books is that they are turning out to be very white and very heteronormative. But they are still part of my comfort reading pile, any time. And how great ws it to see Claire from Garden Spells, just for a few moments? I'm glad this one is so good. I've loved everything by Sarah Addison Allen so far and I'm anxious to get to this one!